Battersea Power Station is a global icon in one of the world’s greatest cities. Woven into the very fabric of London’s identity, the four iconic chimneys and brick-cathedral structure hold a special place in the hearts of Londoners as a symbol of the city’s industrial heritage, technical ingenuity and creative dynamism. From its very inception, Battersea Power Station's transformation has been as ambitious in scale as it has been in design and innovation. Guided by Rafael Viñoly’s vision, a team of the world’s most prestigious architects and designers are transforming the 42-acre site into an exciting and meticulously integrated new neighbourhood — one where locals and visitors alike can enjoy a unique blend of restaurants, shops, parks and cultural spaces. 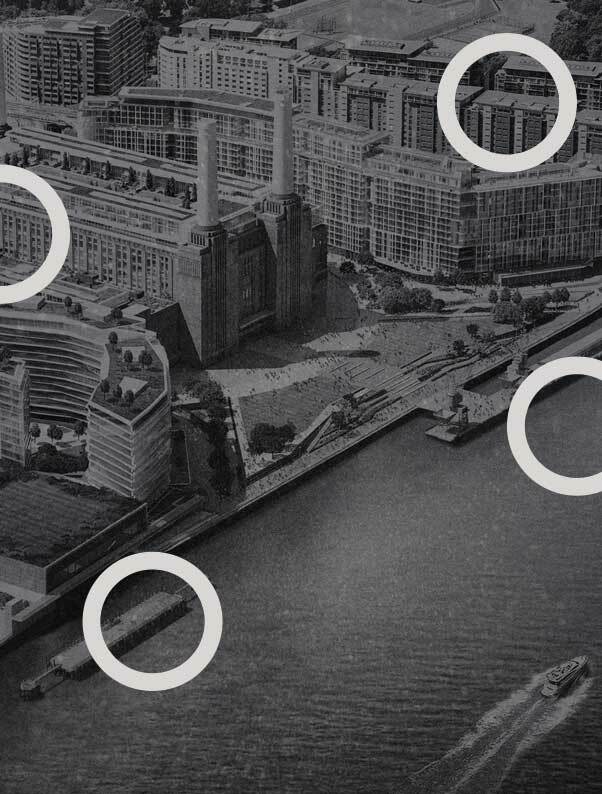 The plans place this world-famous cultural landmark at the heart of a new global destination, transforming Battersea into a new, 21st-century kind of powerhouse: a creative, cultural and commercial one. This iconic London landmark has been lying dormant for decades — but now Battersea Power Station is coming back to life. This extraordinary building and the whole surrounding area is being transformed into one of the world’s most exciting new neighbourhoods. Home to a new generation of world-class retail spaces, leisure facilities and cultural activities, the Power Station is set to energise the capital once again. The mesmerising scale and industrial heritage of the two Turbine Halls will be the stunning backdrop to the world’s most intriguing and celebrated brands. Inspiring customers with innovations, romancing them with the ‘art of making’ and creating communities for loyal fans. The timeless Art Deco setting of Turbine Hall A has been masterfully restored to create London’s most sophisticated shopping atmosphere. Playing host to statement retail formats, experiences and events courtesy of the most established global brands, Turbine Hall A appeals to customers who desire a stylish yet refined shopping experience. The Brutalist architecture of Turbine Hall B is the perfect backdrop for a curated collection of contemporary and celebrated brands known for their considered touch and remarkable brand power. Turbine Hall B appeals to the curious customer looking for experiences that are beyond intriguing. Found within the beating heart of the Power Station is the lively food hall — a collection of tantalising eateries, cafés and bars — filled with flavours from all around the world. Four statement restaurants deliver mouth-watering creations to customers in front of their eyes, throughout the day. A short walk from Chelsea and Sloane Square, Battersea Power Station occupies one of the most accessible locations in London. It’s situated at the very centre of the new Nine Elms neighbourhood on the South Bank of London’s Central Activities Zone (CAZ) — a regeneration project that’s one of the largest in Europe. The biggest names in property development, finance, hospitality and commerce are working with local government to transform a 500-acre site comparable in size to London’s West End. It’s a whole new neighbourhood, a whole new business district and commercial hub — with the Power Station at its centre. 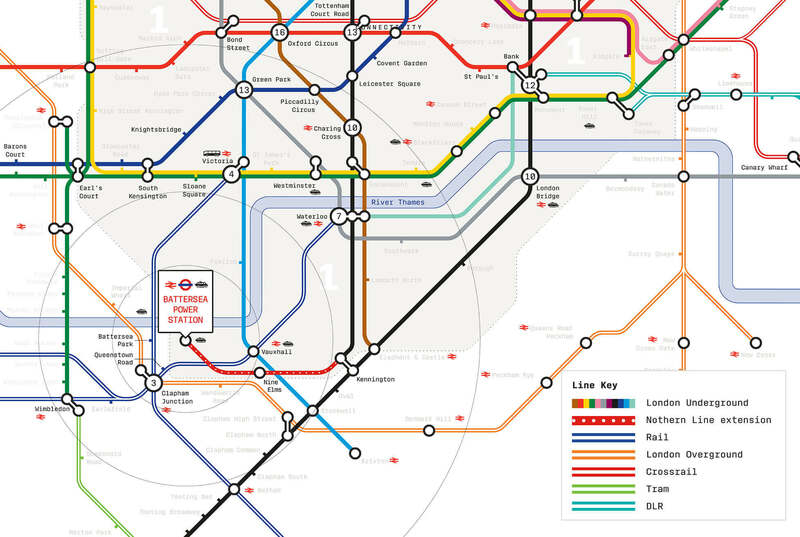 Where better to build London’s fourth and finest retail pillar? 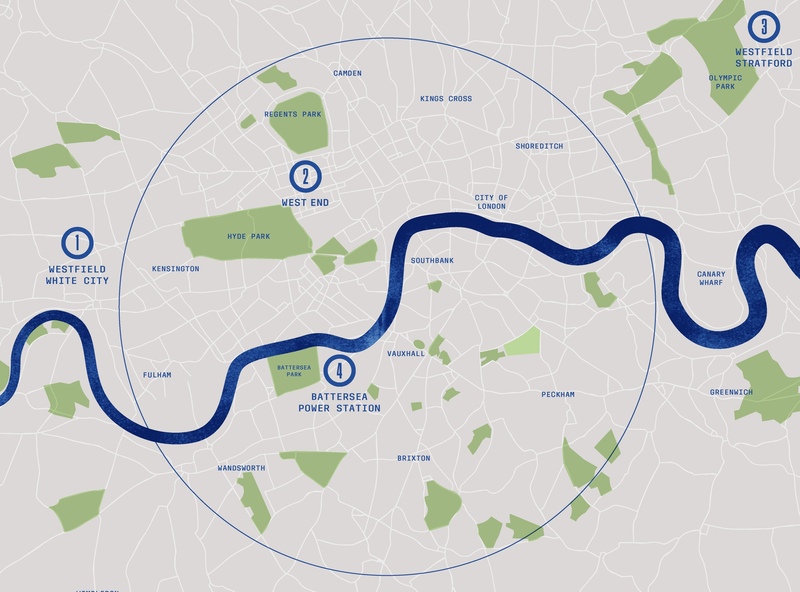 Battersea Power Station’s new Zone 1 Northern Line station will be 13 minutes from the West End and 12 minutes from the city. There’s a buzz in the air around Nine Elms and it’s fast becoming the most sought after area in London. Some of the world’s biggest names and most respected institutions are calling Nine Elms home — giving further momentum to this remarkable feat of regeneration. 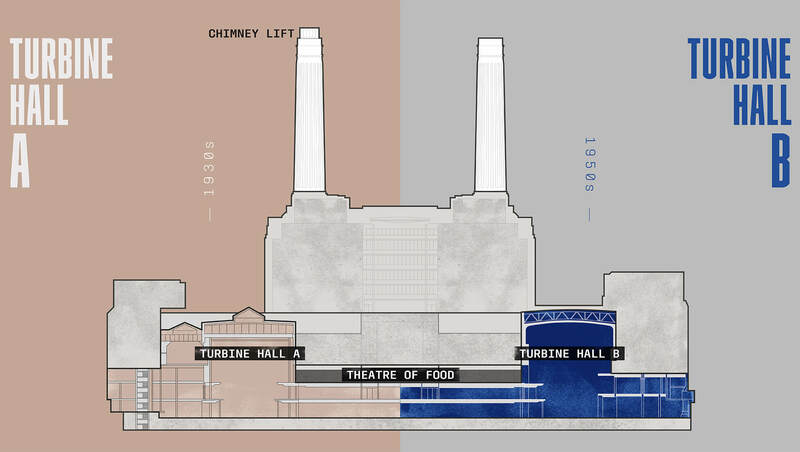 Circus West is the first completed phase at Battersea Power Station and opened in 2017. The 866-unit residential building overlooks River Thames and the 6-acre Power Station Park and creates a long, curving promenade along the western edge of the neighbourhood. The commercial spaces are made up of a mixture of refurbished railway arches in the west and brand new units that face the Power Station and river. Taking inspiration from other successful London villages, it provides people with all the day-to- day essentials together with some of the finest artisan retailers in London. It’s where you’ll find the florist, the baker and the butcher as well as a selection of high-quality restaurants, a village pub, 30,000 sq ft of workspace and a community hub. Electric Boulevard, framed by world-class buildings by Foster + Partners and Gehry Partners, will be an exciting space and an exhilarating part of Battersea’s redevelopment. The new Battersea Power Station underground station at the southern end of the Boulevard creates the gateway to the site as well as giving access to the Power Station and riverfront. The Boulevard has over 40 retail units, including some of the largest retail spaces on offer. It will also be home to over 10 restaurants, a hotel and a gym. Housing international flagship stores and some of the best operators on the high street, there will be something for everyone. This will be the place to shop for the latest trends and designs together with those everyday essentials. Built into the North-West Chimney, a glass elevator as great as any whisks visitors 100m into the sky to enjoy 360º views out across London’s famous skyline. Over 19 acres at Battersea Power Station are set aside for parks, sky gardens, water features, playgrounds and river frontage. The implicit invitation to simply sit back and enjoy the view or take a peaceful stroll in the middle of a hectic global city is as rare as it is precious.